Is My Cat Making Me Sick? From the most famous zoonotic disease—the Plague—to the most recent (Bird Flu), diseases that can be transmitted from animals to humans have been a source of concern for hundreds of years. Known as zoonotic diseases, many potential illnesses still exist today. The most common are rabies, ringworm, and Lyme disease. Some of the more exotic or rare ones include the plague, tuberculosis, cat scratch fever, tick paralysis, and Hantavirus. The types and incidences of zoonotic diseases vary throughout the world. However, although it may be possible for your cat to pass an illness on to you or your family, the instances of this are relatively rare and preventative measures can be taken. Any human who comes into contact with a diseased animal is at risk of infection. But some are more at risk than others, particularly pregnant women, infants and small children, the elderly, people with compromised immune systems, or vets/zoo workers that come into contact with a large number of animals on a regular basis. Please keep in mind that veterinarians are not licensed to treat humans. If a vet suspects a zoonotic disease, the vet should alert the pet owner and encourage her to contact a human physician. transmission of zoonotic diseases. Do not have oral contact with your pet through sharing food or kissing directly on the mouth. Do not touch your cat’s waste products or objects dirtied by the waste products. If you must handle waste products (for example, cleaning a soiled carpet), be sure to wash your hands carefully and thoroughly—even under the fingernails—immediately after you finish. As mentioned earlier, certain members of the population are more susceptible to zoonotic diseases. Cat litter boxes should not be cleaned out by pregnant women or those in ill health. Whoever does clean the litter box should wash their hands carefully and thoroughly immediately afterwards. In particular, dirty cat litter can spread toxoplasmosis, a disease that may cause severe birth defects if the pregnant mother is infected. If you have small children and are considering getting a pet, it may be a good idea to get an older cat instead of a kitten. Well-cared-for older pets are less likely to become ill or spread diseases, and adopting an older cat also avoids the pitfalls of litter box training. Taking in stray animals that may be sick is also not recommended. Small children should not play in sandboxes or dirt in parks that may be used as “toilets” by local cats and dogs. Watch children carefully when they play with animals to ensure they do not engage in oral contact or get bitten or scratched. Teach your children about the safest way to play with animals and to stay away from strange animals, only approaching the family pets. 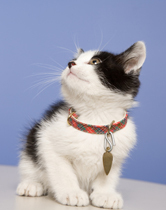 One way to prevent zoonotic diseases is to keep your cat as healthy as possibly. If possible, make your cat an indoors-only cat. Stick to the vaccination schedule recommended by your vet and control flea and tick infestations as soon as they occur. Ask if there are any other steps you should take to ensure health for your cat and your entire household. If you do allow your cat out-of-doors, try not to let it hunt wild animals, as this is how it can become infected with the toxoplasmosis parasite mentioned earlier. Keep your pets away from any wild or stray animals, and watch them closely for signs of infection. If you do notice any symptoms, schedule a vet appointment immediately and get the proper treatment. If you have further concerns about zoonotic diseases, there are several places where you can get more information. The first place to start is your own veterinarian, who may have informational brochures or could point you in the right direction. The public health department and Center for Disease Control (CDC) also offers many informative resources. Finally, the Internet is a popular way to search for further information; just be cognizant that everything found on the Internet isn’t always true! Do your research and seek out a professional opinion when you have questions.